I had my introduction to Pilot fountain pens via the Pilot Metropolitan and the Pilot Kakuno, both were excellent entry level fountain pens. I wanted to up my Pilot fountain pen game so I popped over to Pen Chalet and saw they were running a discount on the Pilot Custom 74. This has been a pen I have read and watched much videos about. Taking advantage of the discount I ordered it and eagerly awaited its arrival. I have since send the pen in to be worked on by a local nib worker, you can find Urner at his site. He specialises in nib size reductions and making a nib flexy-er. Performance of the nib after having it worked on will be covered below. The Pilot Custom 74 (not Custom Heritage 74, I made that mistake.) came in a regular Pilot black clam shell box. Inside the box, there is a Pilot cartridge as well as the warranty booklet. I appreciate that a CON 70 converter was provided with the pen. 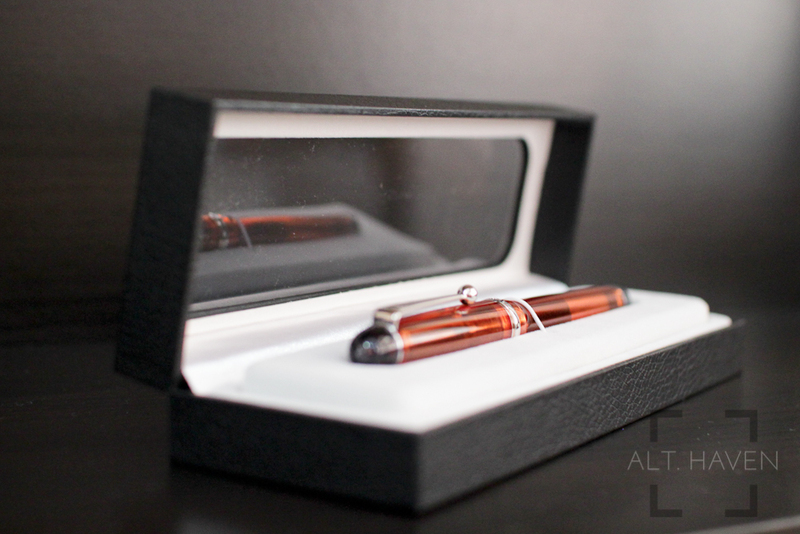 The Pilot Custom 74 is a round ended pen with transparent orange body with smokey clear tip and end. To complete the package, it is accented with silver trimmings. The clip is a simple silver piece narrowing down to a ball at the end. I guess the ball is supposed to aid the clip going over thicker fabric but I found that it was no harder or easier to clip onto things. The clip itself is fairly stiff. The cap unscrews easily in 1.75 rotations. Inside the orange tinted clear cap is a darker clear inner cap. I have had ink splatter inside the cap so if you are OCD about such things it might be better if you picked the opaque versions of this pen. At the end of the cap is the centre band with the words "Custom 74 • Pilot Made in Japan" around it. The grip section is a smoke clear plastic, similar to the tip of the cap and the end of the barrel. The barrel is just a simple affair. It tapers down to a rounded end on either side. It is a straight barrel which unscrews easily to reveal the converter. The Pilot Custom 74 takes the CON 20, 50 and the largest capacity converter that Pilot has, the CON 70. The pen has the just right balance between light and hefty. A fully filled CON 70 probably added a little heft to an otherwise light plastic body. With the cap unposted, the pen balances well in my hand. If the body is too short for you, the cap can be posted. Personally I found the pen a little back heavy once you post the cap. 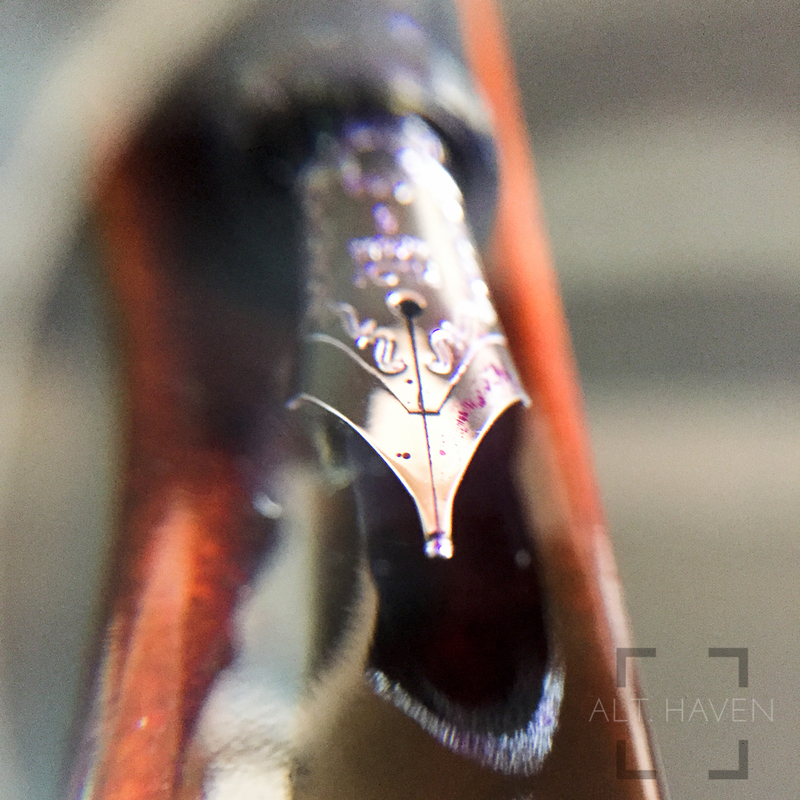 The Pilot Custom 74 is available in a number of nib sizes from the F to B. 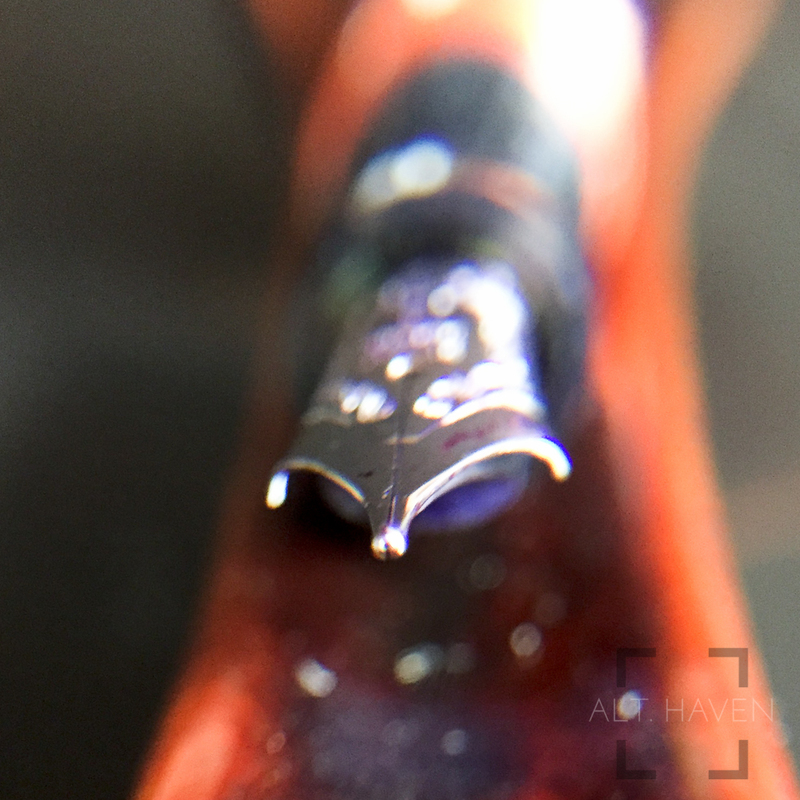 It is a #5 nib size which is same nib size as the Pilot Custom Heritage 91. You could do a nib swap between them. I got the Pilot Custom 74 with a M nib. This comes the hardest part of the review. By all accounts that I have read online, the Pilot Custom 74 is an excellent pen. Most didn't have any problems with their nibs out of the box. I am sad to report that I don't have the same experience. My nib writes funny. It writes smoothly but it writes very wet in some direction and almost all dried out in others. I wasn't able to diagnose the issue properly. It doesn't make sense to me. I expected a little difference between the directions but not that much. I have tried some suggestions from the local group but all I did was misaligning my tines. The tines were later fixed but the pen still writes the same. 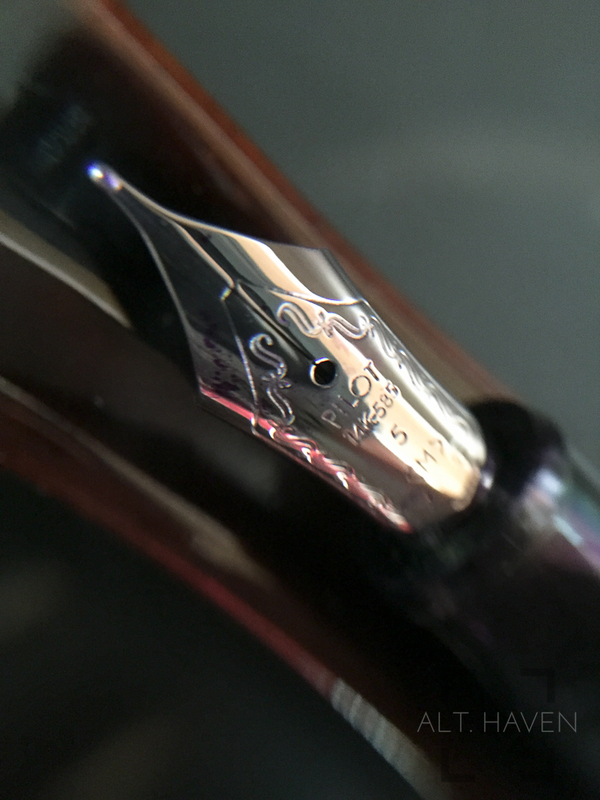 I will definitely be sending this nib in for adjusting. As it stands now, I find it barely useable. As I have mentioned above I have sent the nib in to be reduced from a medium to a fine and got the weird writing issue fixed in the process. I paid SGD$35 for that. It was money well spend since it changed a unusable pen to one that I just loved the way it feels on the page. I can still squeeze a tiny amount of line variations if I put a little pressure on the nib as I write. I cannot recommend anyone buying the Pilot Custom 74 with the way it wrote before I got the nib worked on. However I suspect my case is far from the norm. The multiple positive reviews of the pen supports my suspicion. Once the nib was worked on, the pen works flawlessly. I guess it is a little of a toss up on what type of nib you get. It is a value for money gold nib pen if you get one that works for you. Disclaimer: I got the Pilot Custom 74 on a discount from Pen Chalet. This has in no way influence my opinion on the pen reviewed.